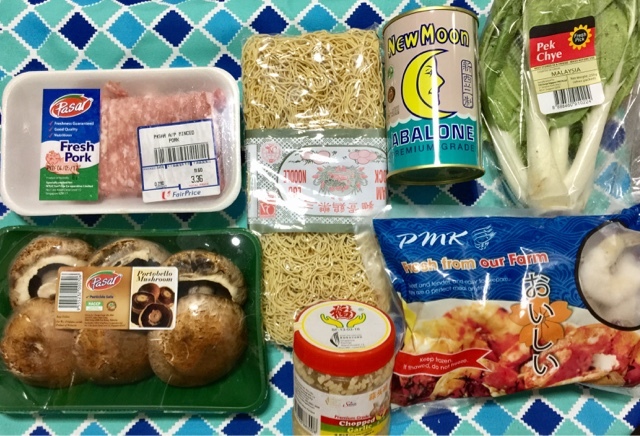 How to cook Abalone Mushrooms Minced Meat Stir-fried Egg Noodles with Ramen Egg? 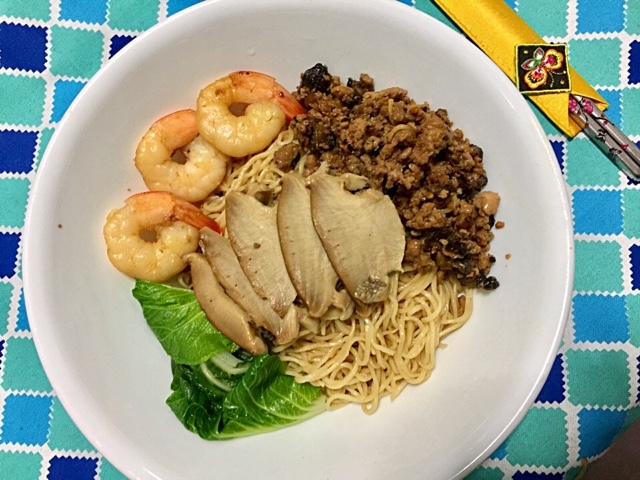 This dish is inspired by my late mother because she used to cook Abalone Stir-fried Egg Noodles on Day 2 of Chinese New Year without fail. Mother's Day is round the corner and I miss her nagging. 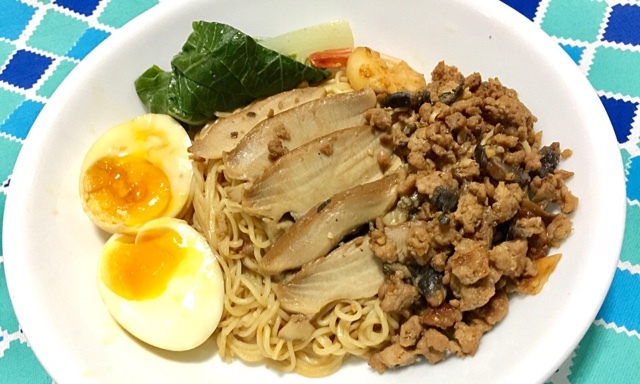 I like this recipe because it reminds me of Sarawak Kolo Mee. I boiled a pot of water and put in the egg noodles when the water was bubbling. I boiled it for 1 minute. I removed the noodles from the hot water and rinsed it with tap water. I drained the excess water and left it aside to be stir-fried later. I poured some oil onto the pan and heated it. When it was heated, I put the chopped garlic and heard the sizzle. 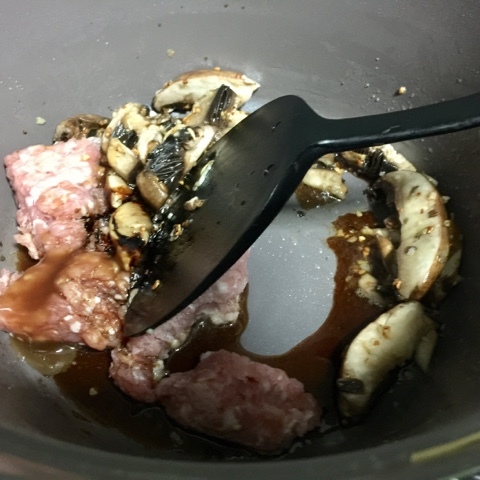 After frying the garlic till it was cooked, I added the mushrooms, minced meat and separated the meat quickly. When the meat was still uncooked, I added 1 tablespoon of dark soya sauce, light soya sauce and abalone sauce. I mixed the meat thoroughly with the sauces and added in the prawns. I stir-fried the ingredients until they were cooked. Next, I scooped out the ingredients into a bowl. I poured a small amount of oil onto the pan which I used to cook my minced meat. I heated it up and stir-fried the egg noodles. Next, I added a tablespoon of light soya sauce and 2 teaspoons of sesame oil into the noodles. I gave it a good fry. By now, there would be a strong and nice aroma of sesame oil combined with the fragrance of the egg noodles. My late mum used to cook the egg noodles this way. 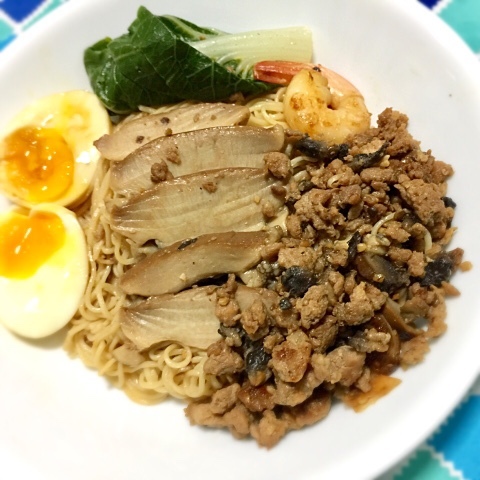 How to cook Ramen Egg? Are you wondering how to get the runny yolk effect inside a cooked egg white? I boiled some water in the pot. I also cooked the Pek Chye and abalone in the hot water. 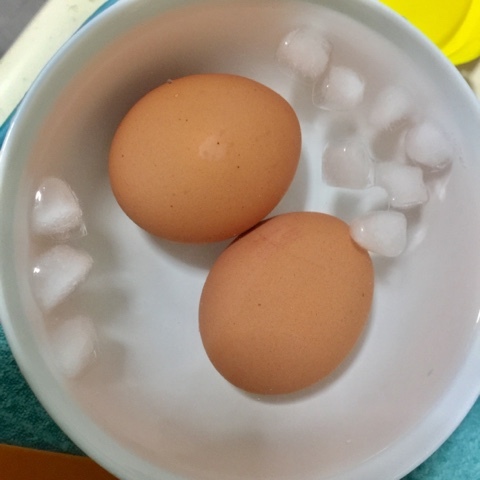 I cooked two eggs for around 7 minutes and placed them immediately into a bowl of ice cold water. After 5 minutes, I peeled off the egg shell. 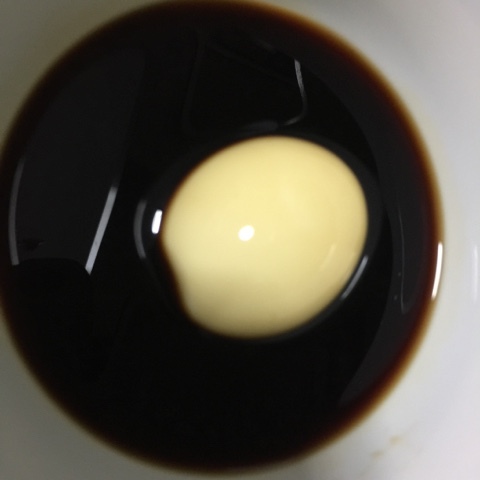 I placed the eggs in a bowl of light soya sauce and udon sauce. The ideal way of eggs marination is overnight. But because this was an impromptu dish, I marinated it for 5 minutes and added a small amount of sauce into the egg yolk. As the egg yolk was soft, it was very difficult to cut it into two perfectly. 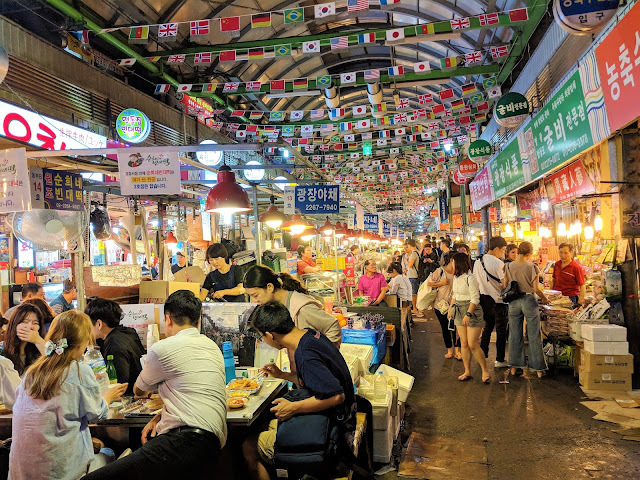 The Ramen Eggs would taste very delicious especially when it was mixed with the sesame oil egg noodles. I placed the noodles first, followed by the other ingredients. It looked very pretty. 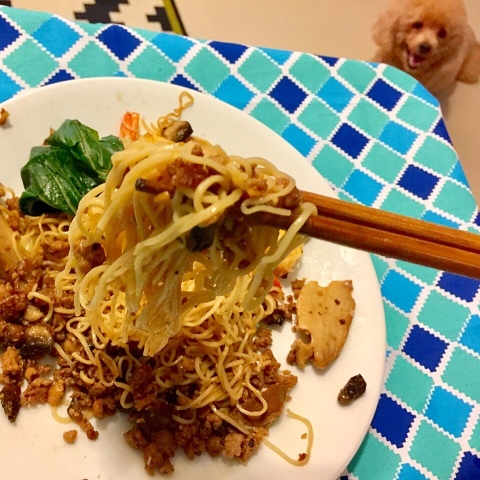 To prepare to eat, I mixed the egg noodles with the delicious mushrooms minced meat. Yummy! Happy Dog wondering if it was for him. Delicious! It tasted like Kolo Mee. Like, Follow, Share my FB page. Calories in egg. Find nutritional information like calories, carbs, fat, protein and fiber for egg.